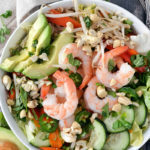 If you like spring rolls you’re going to love this easy Shrimp Spring Roll Salad loaded with large shrimp, sliced cucumber, avocado, red peppers and fragrant herbs on a bed of crispy lettuce and tossed in a delicious dressing. In 2001 I had the opportunity to travel to Vietnam. It was a once in a lifetime adventure I’ll never forget. For two weeks I traveled the country often by moped and got to experience some small towns that didn’t see tourists often. It was quite the journey. While I could go on and on about my travels to Vietnam one thing I remember so distinctly about that trip is when I fell in love with spring rolls. It was love at first bite. 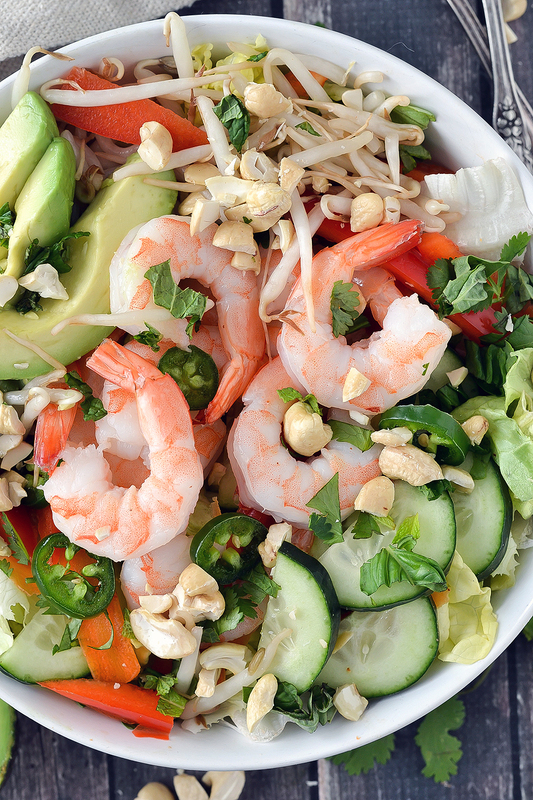 The combination of the shrimp with the lettuce and crunchy cucumbers combined with the fresh herbs was incredible. Since then every time I have spring rolls I always think back to my journey to Vietnam and that very first time I had spring rolls. That’s one thing I love about food. It sparks memories and creates bonds with people. Enjoying a meal whether it be with a group of people or with your family gathered around the table for dinner or a Sunday supper. Food brings people together. What I also love about food is that eating good food not only tastes amazing but also nourishes our bodies. Taking care of our bodies and nourishing it with healthy foods that are filled with nutrients is so important. When you eat good, you feel good! I love February! It’s one month closer to spring and it’s filled with lots of love! Not just because of Valentine’s Day but it’s also American Heart Month. Focusing on heart health is super important. This year I have teamed up with Dish on Fish to bring you easy and delicious heart- healthy recipes you’re entire family will love! 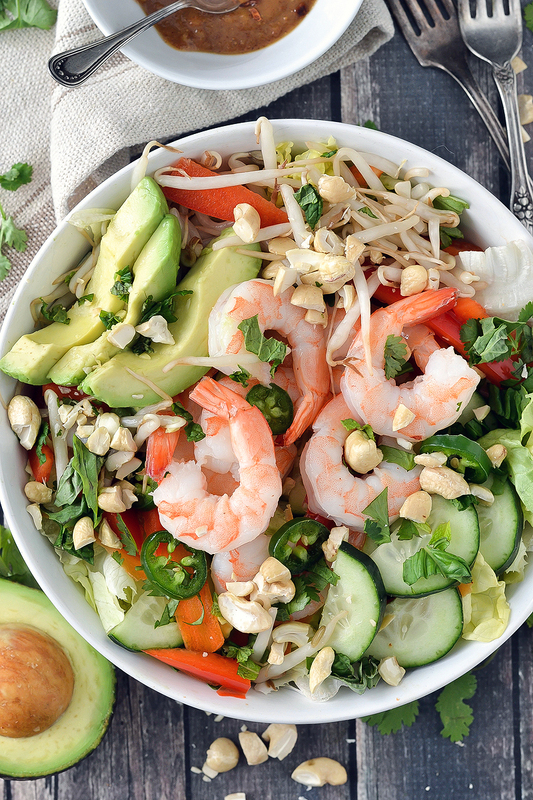 To celebrate American Heart Month and my love for spring rolls I have created this healthy and delicious Spring Roll Salad that is loaded with large shrimp, sliced cucumber, avocado, red peppers, carrots, along with some fresh herbs and tossed with a delicious dressing that is incredible! This dressing is so good I could just eat it with a spoon! Unlike some salads where I may go a little overboard with dressing for this salad I suggest taking it easy on the dressing. There is so much flavor going on with the salad that you really don’t want the dressing to overpower it. And even though this dressing is so good when tossed in the salad a little goes a long way. I also like to add some chopped raw cashews and bean sprouts for a little extra flavor and crunch! Some may be against the bean sprouts. If so, just leave them out although I personally love them and I think they make an excellent addition to this delicious salad! What makes this salad even easier is there is ZERO cooking involved. Just prep and eat! 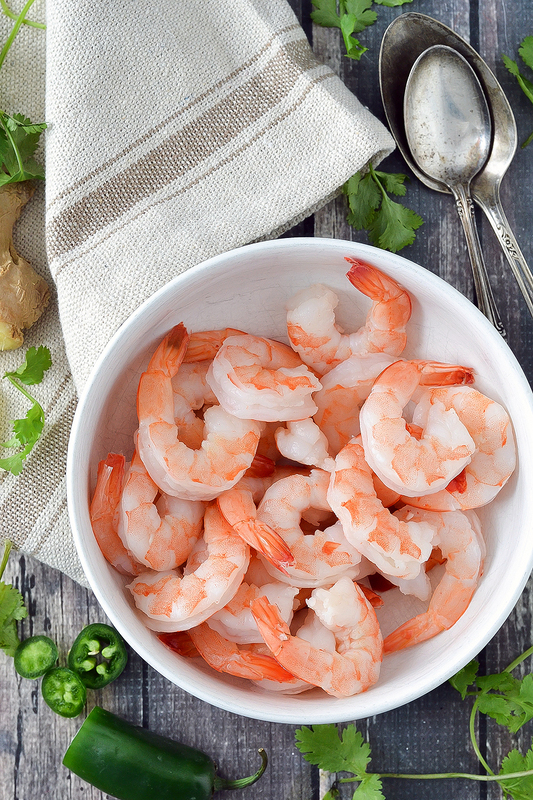 I grab cooked, shrimp at the store and toss them into salads or to have on hand to eat for a low-calorie, protein-packed snack. While I’m not a doctor, nutritionist or dietician I love to research health benefits of food, amongst other things to make sure I’m educating myself and nourishing my body along with my family with healthy foods. Seafood is an excellent source of key nutrients the heart and body need. According to Dish on Fish and the U.S. Dietary Guidelines for Americans they recommend eating seafood 2-3 times a week to reap all the benefits that seafood has to offer. That seems pretty easy to me! 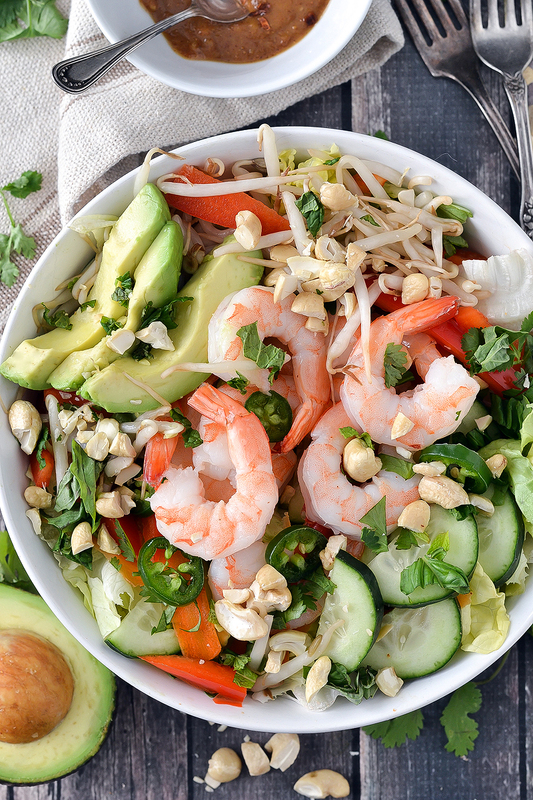 And with a delicious salad like this Shrimp Spring Roll Salad I could eat this almost everyday! For more information about Dish on Fish including some incredible recipes you can check out the Dish on Fish blog HERE! I also suggest staying connected with them on Facebook, Pinterest and Twitter for more ideas, inspiration and information! 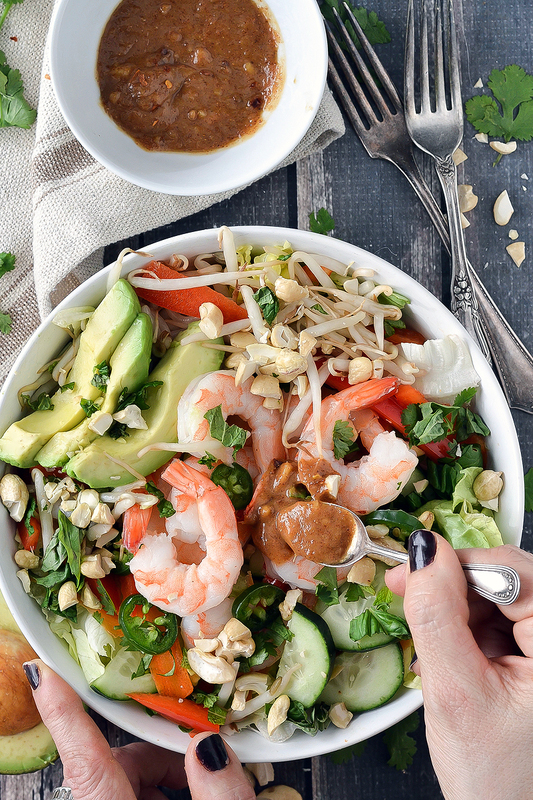 If you like spring rolls you're going to love this easy Shrimp Spring Roll Salad loaded with large shrimp, sliced cucumber, avocado, red peppers and fragrant herbs on a bed of crispy lettuce and tossed in a delicious paleo-friendly dressing. Place all the ingredients for the salad in a large bowl. There is so much flavor in this salad that I don't recommend using a lot of dressing. You want just a hint of the dressing and not to be overwhelming. You want the dressing just to coat the salad, not overpower it. If you do prefer more dressing you may want to double the recipe or make a second batch if you wanted a little more. I've made this dressing many times and the consistency is usually good. I have noticed if you use a thicker almond butter the dressing but be thicker after you mix it together. To thin it out use add a little water to thin it out to your desired consistency.